Our glasshouse domes create an excellent environment to experiment with modern growing techniques such as aquaponics, hydroponics and vertical growing. Excellent ventilation, uniformity of temperature teamed with 97% light transmission from the multifaceted glass ensures maximum solar gain, leading to an extended growing season. How can they benefit my school? These modern growing techniques offer numerous opportunities for learning on the Curriculum. From primary, up to secondary and beyond, they provide a perfect learning tool in the core subjects of biology and plant physiology, mathematics, chemistry and physics, plus special needs rehabilitation and self sustainability models. Hydroponics, by its most simple definition, is the growing of plants without soil. When you grow hydroponically there is no digging, weeding or soil borne pests or diseases. There is no need to worry about fluctuations in the weather such as too much rain, frost or not enough sunlight. The plants are supported in an inert media such as perlite, vermiculite, clay pebbles, or rockwool and are fed a nutrient solution. 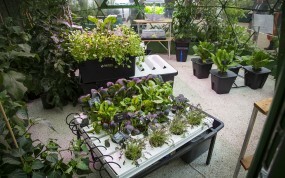 Aquaponics are living food ecosystems. It is the technique of growing plants and raising fish together and creating a symbiotic relationship. It combines both aquaculture (the culture of fish) and hydroponics (culture of plants without soil). The system is based around a plant bed and a fish tank, both working together. 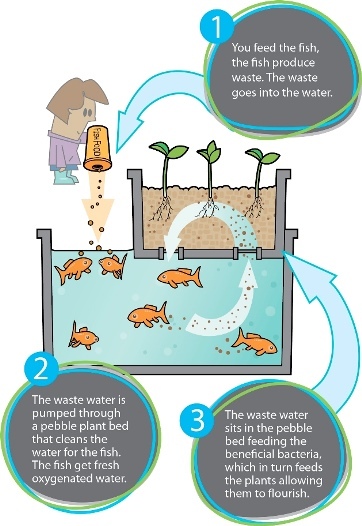 The fish water feeds the plants and the plants filter the water for the fish, all you need to do is feed the fish.